The Arts Club presents Buddy: The Buddy Holly Story at the Stanley Theatre on now until July 12, 2010. It’s the world’s most successful rock ‘n’ roll musical and has been viewed by more than 20 million people across the globe. â€œPeggy Sue,â€ â€œThatâ€™ll Be the Day,â€ â€œOh Boy,â€ â€œNot Fade Awayâ€â€”the list of hit songs penned by Buddy Holly goes on and on. By his untimely death, the legend had already changed popular music forever. 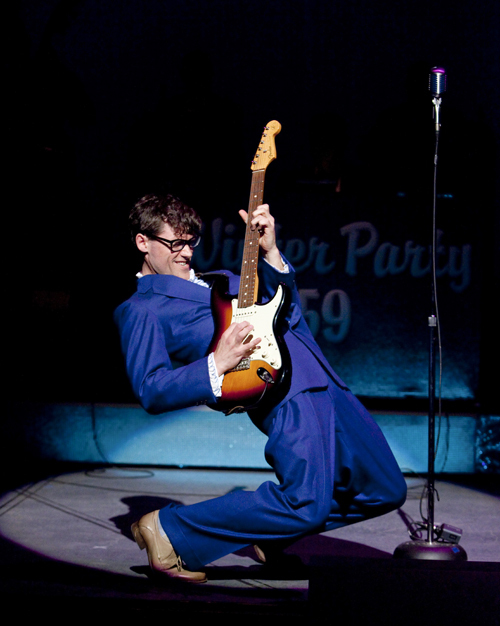 Vibrant and celebratory, Buddy: The Buddy Holly Story highlights the talent and passion that lives on in his music and continues to thrill audiences long after they dance out of the theatre. I have two tickets to give away for the performance May 27th and I also have a special dinner pairing to offer as well. The winner of this prize will enjoy a four-course meal for two at West, a South Granville restaurant that recently won Gold for Best Service, Bronze for Restaurant of the Year, and Bronze for Best Last Course per Vancouver Magazine. Dinner at West will be arranged for 5:00pm on the 27th so that the winner and their guest may enjoy their meal and then head across the street to see the musical at the Stanley. To enter to win please leave a comment on this post. I’ll draw the winner Monday May 24th. Update May 25th I drew the winner’s name randomly and it was… Lacy. Congratulations and have a fantastic night out! I’d like to thank everyone for sharing their stories and experiences, it was so interesting to read all the entries. Please do get some tickets for the show if you can, it will be amazing. Fine print: The approximate value of the dinner for two is $150 (beverages & gratuity are additional). This looks like it would be a great night out!! Would love to win, my girlfriend said she really wants to see this. Sounds Amazingly Fun!! I love the Stanley! Sounds like an awesome night out! Would love to go, excellent cast. This year is my champagne birthday. I’m turning 27 on May 27th. I’d love to celebrate with dinner at West and then go to ‘Buddy’ – I love the Stanley, they put on incredible productions, but I haven’t been there since ‘The Producers.’ Winning would be the perfect way to celebrate my champagne birthday! I love this musical, I saw it in London back in the early 90’s. I remember the audience up and dancing in the aisles. I will be your Mary Tyler Moore. It looks like a good time! why that’s a rockin’ photo of Buddy! Oo yes please? I would love both those things so much. BUDDY IS FROM MY ERA I WOULD LOVE TO GO TO IT AND BRING BACK THE WONDERFULL MEMORIES HE WAS THE BEST OF ALL TIMES.MY FAVORITE GUY. Fingers crossed! I hear they are dancing in the aisles! Oh yeah! a great show and a great meal! What could be better?! Yay what a treat! 🙂 I love the shows this theatre always brings! Love Buddy Holly!, looks like it will be a spectacular show! I’m so haaaash poooor. This would be great!!! Wow, this sounds like a blast, I would love to go! Sounds like an incredible show! I’ve heard great things about this production. Would love to win tix! I’d love to take my Mom to see this for her 60th birthday in June!! Sounds wonderful! My husband would be able to sing along! Rock n roll me to the show~! I love Buddy Holly and would love to win tickets! That’ll be the day when a contest I win! That’ll be the day that will feel like a sin! You say I’ve got shot for a play and some din! Cause that’ll be the day when I win! My daughter and I often go the theatre and we especially love the Stanley. Would love to win this fantastic gift. i hope this is the right spot to enter to win tickets for buddy holly, sounds like an awesome show! good luck to all! The Arts Club brings together amazing talents!! I would love to spread the word on this spectacular show ( & dinner) Pick me Please!! A show and dinner with my hubby. Sounds great! My son is graduating and is a theatre junkie. It would be an awesome way to celebrate his graduation as we thought “That’ll be the day” he graduates. Not really, but it is hard to believe he is graduating! Saw it yesterday. AWESOME. Have to see it again and again! I’m planning to take my mother (a huge Buddy Holly fan) when she comes out to visit in the summer, but I’d love to have a chance to take my husband first! That sounds like a great nite! Love musicals and thanks for the info and opportunity! Bring on the old time rock and roll. Peggy Sue – One of the songs I remember waking up to in high school. My how time flies. I’ve heard the cast is amazing! I am the Musical Theatre teacher at Pro Arte Dance Studios, and love seeing any musicals that are playing in the city. I have enjoyed many productions at the Stanley, especially the ones that have some of my students in them. My girlfriend raves about the “West Restaurant”, so the evening sounds like a fantasic package. my wife just mentioned that someone she works with saw this and said it was awesome! would love to take her….dinner is good too!! Oh Buddy….oh Buddy…..should have taken the Greyhound! Oh Buddyâ€¦.oh Buddyâ€¦..should have taken the Greyhound! I’d love to surprise my husband with a great evening of “Buddy”! I’ll throw my name into the mix here! I would love to see this. Fingers tightly crossed. Please enter my name for the tickets and dinner! My era…..would LOVE to have the opportunity to attend! Looks like an amazing show! I love the Arts Club and hope I get to check this show out. A great way to celebrate my Fiance’s birthday! Sounds like a fun play and an awesome restaurant – what a great date night that would be! My daughter loved the show. I want to relive the era of poodle skirts! I’d come to town for that! Buddy and I go way back. Now, that sounds like a fantastic night of entertainment! Deborah, The Velvet Room Boutique….Canadian Talent. Canadian Fashion. Canadian Made. Please enter me. Wow! You’ve had some great fun giveaways lately! Would love it – It’s been a long time! It would be the perfect evening/outing with my favourite niece. We both love theatre and enjoying a nice dinner together. What a marvelous prize you’ve offered! hmm other comment didn’t work, so I’ll try again. Would love to go! Sounds amazing. I remember falling in love with Buddy Holly’s music, and then being crushed when I discovered he had died so tragically! I love him, and I love the Arts Club venue! Pick me pick me! I can’t think of a better way to spend a thursday night in my neighbourhood! This sounds like a wonderful night on the town. Just in time for my birthday! I’ve got my fingers crossed! I remember the day that Buddy Holly died! Would love to see this show. My husband and I have 3 days off without the kids for the first time in two years – thid would be a great way to start off our weekend! Amazing food AND amazing theatre? Count me in! Ooh, I would love to go!! I would give these to my wonderful daughter and her husband who live in Vancouver. They enjoy fine dining and fine entertainment. Wow, this would be totally awesome! I hear the show is amazing!! What a great evening. Will singing along be allowed? I may not be able to help myself…….. Truly an amazing show. I will be seeing it again! Please enter me in the contest. I have my fingers and toes crossed!! I still remember “The Day the Music Died”. Yes I am THAT old! Would love to re-live the memories. I’ve been hearing some great reviews for this show! Would love to go. Simply adored Buddy! Sounds like a wonderful evening!!! Either way this is one play I don’t want to miss. Oh Boy! That Will Be The Day to remember – A complimentary night on the town and a trip down memory lane for my partner and myself. Whooee! Well done to the Arts Club once again! My husband and I have enjoyed going to theater productions in Vancouver for years and have been very impressed by the quality that we have seen. Would love to enjoy an evening out to see Buddy Holly with dinner at West! Sounds like a wonderful evening!!! Either way this is one play I don’t want to miss. This is great! Pick me! Moderation – no moderation on this one – just sheer delight! Holly’s documentary was on TV this past week…what a performer and talent. I am sure you have done himOh Boy! That Will Be The Day to remember â€“ A complimentary night on the town and a trip down memory lane for my partner and myself. Whooee! Well done to the Arts Club once again! justice!! Looking forward to the musical. Love the Arts Club productions! In desperate need of night out! We already have a group of twenty-nine attending the June 26 performance – all of us in “Buddy” attire. We’re going for burgers and shakes – “SHAKE YER BURGY” – before the performance, just around the corner @ Vera’s. That’ll be the Day! by the time we get to the theatre!! I would love, though, to treat my “Peggy Sue” to a nice dinner out at the WEST. I would give the tickets to my son and his friend – or we (Peggy and I) would attend at the WEST in our “Buddy” attire and trip the light fantastic across the street for the performance! My (just turned 9 on May 19) daughter loves the theatre. I’m taking her to 3 shows at the Children’s Festival during the Victoria Day Long Weekend. On May 15, she saw Shakespeare’s As You Like It at the Waterfront Theatre. In November 2009, she saw White Christmas at the Stanley, and two Carousel Theatre’s productions: Robin Hood and The Big League. In December 2009, she went to two – count ’em two – shows of the ballet The Nutcracker. Last summer, she saw both Theatre Under the Stars productions at the Malkin Bowl. Last May, while visiting Toronto, she saw The Jersey Boys (a musical about the life and times of Frankie Vallie and the Four Seasons). I’m sure she would loooooove to see The Buddy Holly Story. My son is a big Holly fan and would love to win this! May 27th is our 21st wedding anniversary! I have been dying to get to Buddy Holly at the Arts Club. Thanks for offering a wonderful evening out! What an awesome way to rediscovery Buddy’s music! Oh my goodness…. A night of eating great food and singing Peggy sue…. Absolute perfection! The show would be wonderful on its own but the dinner would really top it off! You don’t know what you’ve been a-missin’! Oh Boy! ooooh this sounds super fun and just in time for my Birthday too! Ooooh! I’d LOVE to go to this! My buddy, my sister… please let me take my sister along. Great show , as good as one could ever ask to see Buddy play live . We saw ‘Buddy’ on the opening weekend but would love to go again. I am continually amazed and impressed by the wonderful local talent we have here and the stars of Buddy are fantastic. I love going to the Stanley & Buddy Holly is one of my fave shows. Dinner would make it that much sweeter! and son in law a dinner date anniversary gift and a glimpse into the music of my youth….rock and roll forever! Love West… love Buddy Holly!!! My brother-in-law (unfortunately now deceased) was a Buddy look-alike so would be fun to attend in his honour! My brother-in-law (unfortunately now deceased as well as Buddy) was a Buddy look alike so would be a great tribute to Bob. HE WAS MY DADS FAVORITE! I GREW UP LISTENING TO HIM, AND WOULD LOVE TO SEE THE SHOW! THANKS! Please enter me in the contest. sounds Great. I have tickets for the July 8 show but would love to go twice and the dinner would be a real treat. This would be a great prize! Thanks for running this contest. I hope I win! Sounds like a fantastic show. One of the great musicals of all time.. would love to see this latest version here in Vancouver, produced by one of our best theatre companies! What a great evening out! Dinner and Buddy!!! A performance and dinner… whoah! Please, I hope I win! Fantastic, this would be a great way to start the good days of summer! It’s my music! I love it, and I’d love a 5 course dinner! The Music lives again! What fun! What a fantastic evening it would be – I will take my daughter who is attending Langara in Theatre production and she would be thrilled. Thanks for the chance. I have loved Buddy Holly since I was a child & would love to see this performance! That sounds like such a fun show to see! My wife and I saw “BUDDY” in London in 1998 and that was the highlight of our tour through London, it was that good. The British Open and Buddy made the trip almost perfect. Would love this! Dinner and theatre, two of my favourite things. Heh. And some good music, to boot. Sounds like a fab evening. Sounds like a great evening! I was so saddened when it came across the wire that Buddy Holly had been killed. I remember it like it was yesterday. When my high school sweetheart and I went to school dances, we always requested, Rave On, one of Buddy’s songs. What fun it would be to have a dinner date and see the show! Love Buddy Holly. Love West. Love my boyfriend and his birthday is coming up in two weeks. This would be an awesome surprise since we’ve both lost our jobs and are watching all our pretty pennies! The perfect way to celebrate my husband’s birthday on the 27th! I’d love to take my husband out on a much deserved date! Good food and a great show! This would be the perfect celebration evening for my husband’s birthday on the 27th! I remember watching the movie about Buddy Holly’s life. It was such a sad story to see him die at such a young age and in such a tragic way. I went to the show last week – took 5 other family members with me – we had a great time. I was dancing in the aisles and singing along. I would love to win a dinner out and go again. I will probably go at least once more anyway!! Thanks. Great Show!!!!! have seen Zach several times with the Human Statues – a truly great performer – cannot wait to see him in this show! Can’t remember the last time I have eaten at a fancy restaurant and gone to a live fun show. This would be truly “Amazing” as Buddy Holly was one of my favourites !!!! I love the Arts Club Theatre and Musicals! This si an awesome giveaway! Thanks! The show was amazing. I know my friend would love it and I would love to see it again! Buddy Holly was probably the greatest of all rock n roll pioneers. If his life hadn’t been cut short, he surely would have surpassed Elvis in the history of rock n roll. To see this play would be incredible. Pick me pick me! I like musicals AND eating out! What a better way to celebrate the days of Buddy Holly! I love musicals and it would be great to share this evening with someone special. Holly is synonymous with Christmas. Sort of. So is mistletoe. Sort of! If I win it’ll be an early Christmas and I bet I’d get a kiss from my wife! How the West was won… by entering this contest. Buddy Holly, The Everly Brothers, Joan Biaz…..an era that has not been duplicated since. Thanks for the remembering. Would make a great birthday gift for my daughter, her birthday is on May 28th. Hope I am lucky. Great music and great food! What an amazing contest. You did good on this one!!! Wow, this is from my wife’s era…..ok mine too…. I saw the show last Saturday with friends. It was AWESOME! I would love to see it again!!!!! well that someday…I’ll win too! I’d love to take my niece to dinner and Buddy Holly for her 19th birthday! Would make a great birthday gift for my friend. Would love to see this show. Good write up – I would love to win!! I really need a night out..cross my fingers..
You have the best contests……Dinner and a show! Whoohooo! Wow – what an amazing contest! Love following you on Twitter! Here’s hoping I’m the lucky winner! What could be better than dinner for two and the Buddy Holly play at the Stanley! Can’t wait to go to see the show! Couldn’t think of a better way to spend an evening than dinner and watching a great performance! Buddy Holly! Yeah! Nothing better than a live show! Give me the live arts any day!!! Love it! I would love to win this prize package – love Buddy Holly music. I had two tickets to go to the Buddy Holly Story, but I gave them away to friends as I had to go to the island to look after my mom who has been newly diagnosed with colon cancer. Now I am back and am available to go. I hope you really consider me. I love Buddy Holly music!! My wife and I met in the “just post” Buddy Holly era and we both loved his music. After approx. 40 years of marriage, during which time we had 3 kids, our youngest at 26 years of age, finally moved out of home last Saturday, 15 May 2010 and in so doing left us after all these years…”empty nesters”. We are now free, with some sadness, to renew old memories and start doing new “old” things. The Buddy Holly Story, with dinner, would coincide beautifully with our new freedom given his era was pretty much where we started out. Sounds like great fun and West is a fabulous restaurant! I remember like yesterday, Red Robinson is still cool too. What a treat this would be! Please include me in the draw and good luck to all. Whoo! That would be a fantastic night and great introduction to a new restaurant. Would LOVE to see this production!!! Our 20th wedding anniversary was last week and we both forgot! This would be a good celebration to make up for our lapsing memories! Rave on! Count me in! My first visit to your page and I found a contest. Love it! Would love to see this show!!! Oh…and a chance to finally get check out West?? Fingers crossed. I’m loving this treat for my husband and I to go to…he’s so deserving of a Father’s Day gift and my fingers are crossed! Thanks for the opportunity to sign up! It sounds like it would be a fantastic evening! That’ll be the night!!! Would so love to go and take my sister, we know every word to every song!! And I have always wanted to experience West!! Wish me luck!! My daughter loves musicals. It would be a great experience for her to be able to watch the play live. Wow! Living in the boonies aka Langley a night out on the town at West (Bon appetit) & the Sights & Sounds of The Arts Club’s Buddy Holly would be a night to remember. That would make for such an incredible evening! would love to take my sister..we know every word to every song,and I have always wanted to experience West..wish me luck!! A West/Stanley evening sounds perfect! Fingers crossed! Wanted to see this performance then realized it was sold out, would love to take my Fiance to the show as she has acted in plays such as Chicago, etc, and an evening away from the kids would be awsome. I want to take my dad to this. We have been so lucky to enjoy the common love for theater and he REALLY wants to see this! I hope I win!! My son and daughter have seen this show already and they are ready to see it again!! Since I am 73 – it was during my time and I would very much enjoy going to see it and refreshing my memory about those now very innocent years which were quite daring at that time. Would love to see this show and have dinner at West! “Everyday” was one of the first songs our class learned to play on guitar in Gr. 7 by our drama/music teacher. I’ve heard such great things about this production of “The Buddy Holly Story”. I hope I win tickets. Thanks for the contest. Hi, What a great tribute to such a legend who’se life ended so soon. I’ve always loved his music, saw the movie & seen an impersonator, but have not seen the musical. I’d love to see the musical and i know a friend I would choose to come with me. We both could use a great night out like this about now. It’s been a while since I’ve been to the theatre and I miss it. I would love to see “Buddy”. Ooooh, it will be so exciting to win, as it is our 10th year anniversary. What a pleasant surprise it will be. “Buddy Holly”…WOW!, and to boot at one of the best theatres in Vancouver. The Stanley theatre is legendary, and how finer of a restaurant to be dining at “West”. One of Vancouver’s #1 restaurants. Hope to hear from you soon! This sounds like the perfect night out before our baby arrives! Dinner out would be enough to impress her. An evening hearing the music of childhood memories, and seeing Buddy brought alive on-stage, would be ‘simply the best’. …..and, I’d be a hero! Well, maybe not. Her name is Heather. Pretty as a flower, we’re lucky in love. That will be the day! count me in! My husband is a big fan of Buddy Holly – would love to see the play – will buy tickets anyway. thanks, Noreen. Front row center would be fine! I would love to relive my youth with my grandaughter, who is an avid fan of buddy holly, the big bopper and richie valens. She sings along to american graffitti in the car when I am driving. It would be a great experience to spend a special occasion like this with her. I’m looking forward to seeing the show. The Arts Club does such a good job!!! My 10 year old Daughter and I have started to go to the theater once a year. It is special night to us and I love to watch her face sparkle with excitment in awe of the actors and actressess. She now wants to learn to Act and Sing. This would be a vivacious night to share with her. 4 course dinner at West – fantastic! We first saw the “Buddy Holly Story in London (UK) in 1993. My youngest son was very interested in life at that time and refused to go so we went with the eldest. We thoroughly enjoyed the performance and our youngest has been regretting missing it ever since. Winning this contest would allow us to finally enjoy the performance with our son and he would be overjoyed. I hope that the performance in Vancouver is as good as the one in London. I’ve loved the music of Buddy Holly since I was a child. Also, West is a restaurant of which I have read excellent reviews but so far have only experienced it from the outside looking in. It would be great to win this package. I’ve already cleared my schedule! Loved him and his music when I was a teeny-bopper and still do! sounds like a wonderful evening … love the music of Buddy Holly and love good food! How I would love to have an evening like this!!! WHAT A PERFECT WAY TO SPEND A SUMMER EVEINING IN VANCOUVER. GREAT COMBO! me me me!! I need a night out as a new mom.. If only life was a musical….. I have heard nothing but great things about the show since it’s opening! I would love to win tickets to see it and enjoy the tunes of Buddy Holly on stage! My friend saw the show and just loved it, so we are ready to go!! My husband and I are ready to have a date night. I would love to take my friend who spends hours volunteering at an animal shelter, she could do with a special night out. Thank you for giving this gift. Day after my 40th birthday! Cool – sign me up! This is an awesome offer and would love to win! Love to see this show with my daughter! I was just a kid when my older cousins were dancing and singing to Buddy Holly’s music. Lots of good memories. Looking forward to seeing the production with my daughter. Hear it’s terrific. Pick me Pick me!! I love the Stanley Stage! This contest actually was what drew me to your website. I was thrilled with what I have seen so far and your blog is now a must read. Thanks. It sounds amazing. Just moved back to the west coast from Canada and definately have Granville Island on the list of places to show my Kiwi fiance! Ooh la la! Fantastic! This is a really great giveaway you have going on! I’d love to see this play @ the Stanley theatre. The last time there we took our daughter kara and her guy Scott to see Les Mis, Kara remember our first time seeing this play @ the Queen E when she was a pre-teen and was so excited to share this version with her guy and her parents (us). So thanks for the memories as that’s what life is made of. You’ve convinced me to go. Also, great blog! I’ll take my Mom. She’d love it and so would I. Thanks! Dinner and a show. Yes please. I would be so happy to win this! Seriously happy! Can’t wait to take it all in!!! I always stop and read the menu at West when I walk by. The food looks delicious! I have always enjoyed Buddy Holly’s music and his life story. It would be great to win tickets to see the show and have a dinner out. My 84 year old Dad is going to see it as a subscriber. He said he read the playlist and didn’t recognize a single song . . . what a waste! He didn’t offer to give up his ticket to me cause he’s going to the lecture with Red Robinson – who has suddenly become a contemporary of his. If I told him this 40 years ago . . ! My wife is convocating at UBC that week and we would love to go! Pick me! Pick Me! This sounds like a great show…will try to go even if I don’t win! My husband would love this – good luck to all – especially me!!! Have heard nothing but great reviews of this production. Would love to see it with my husband, who comes from Peru and who would like very much to experience the music that was important to me when i was young(er). That would be the best belated mothers gift I could get. Music from my era. Cool contest… hope I win! Oh Ya! Ohhh “Baby Sue”! It’d be a rockin’ good time to relive Buddy Holly Days. The same female star who was in ‘Dirty Rotten Scoundrels’ @ Queen Playhouse, performs in the Buddy Holly story. The last time I was at the Arts Club was 10 years ago & I was 17. What a perfect 10th year anniversary for me if I win. Bonus: I love B.H.’s music. I would love to take my daughter to this. She learned about Buddy Holly from Weezer, so I think it’s time for the “real” thing. Great play and one of the best restaurants! I’m definitely down for that! I need some inspiration about now. Music is the best way to connect and feel good with a Buddy. Loved the show and so did my 69 yr old friend who reminisced that time of her life and the music that defined it 🙂 I also thought the singing was magnificent! I am looking forward to Buddy Holly whether or not I win the tickets but am really looking forward to trying out the great food at the WEST. I have walked by and checked their menu on countless occasions but have never gone in. My fingers and toes are now crossed in anticipation! What a great opportunity – good food and good theatre combined! I’m of the Buddy Holly era and would love to see this show. I hope I win Buddy Holly is Amazing Everyday is one of my favorite songs. Its sad that he dies at the age of 22 we never saw his full potential. I HOPE I WIN!!! It is a great show. I took my sister to it for her birthday on May 18 and we both loved it. It would be great to be able to gift someone else with tickets and also have dinner at West, right in my neighbourhood. Dinner and the theatre? Is there a better way to spend an evening? Pick ME! Pick ME! THANK-YOU FOR OFFERING THIS …. OUR FAMILY LOVES BUDDY HOLLY–HOPE WE WIN!!! Please pick me – would be an amazing night out! Sounds awesome….a night away from the kids. I love going to plays and the “The Buddy Holly Story” looks great. It would be a double treat with a dinner at West. Wow! Saw it yesterday and it is absolutely the VERY BEST I have ever seen — felt like we were at the Buddy Holly concert! Would LOVE LOVE LOVE to go again! Hope I win!!! Great venue, terrific restaurant, and the play is supposed to be a smash. Wow, terrific prize package promo. Wow, I would love to go! He’s one of my biggest musical influences. That sounds like so much fun. Fingers crossed! Wow! Tons of entries already but I’m hoping for it too!! Oh this looks like a blast! Pick me! Pick me! Love love Buddy Holy. Grew up listening to him. That would be totally awesome!! Would love to go – looks like a great show! Buddy Holly Rocks. I love the Stanley Theatre. Would love to see it – have heard great things about it from friends in London. I’ve heard fantastic things about this production and others in the past. WEst is considered one of Vancouver’s finest restaurants. I have been a devoted fan of Buddy Holly since 1956, and, have strong memories of when his death was announced on the public address system in high school, and the sorrow that shook the whole school. A few years ago my wife and I travelled to London, England, and, we were thrilled to view the staqe show of the “Buddy Holly Show” in London. I am now in my mid-sixties, and cannot think of a greater thrill than to see the “Buddy Holly” story in my home town (Vancouver, B.C.} after all these years.